THE New Norfolk Guardian Pharmacy has been named the best in Tasmania for the second year running. 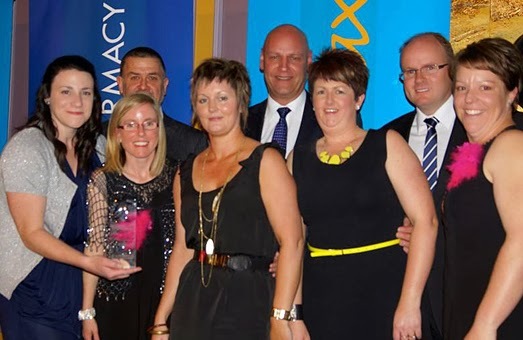 The win was announced at the Sigma Pharmacy Assistant Annual Conference in Launceston last weekend. The event provides recognition for Amcal and Guardian stores and the New Norfolk pharmacy will now compete for the title of National Guardian Pharmacy of the Year which will be announced in March 2014. Nicole Lawrence, Tasmanian Pharmacy Assistant of the Year (Amcal/Guardian combined). Janelle Maw, Tasmanian Store Manager of the Year (Amcal/Guardian combined). The nominees were judged on passion, excellence and experience, with an emphasis on community engagement and innovation. Gil and Bel are extremely proud of the whole team and say it is wonderful to have their efforts acknowledged by their peers. New Norfolk Guardian Pharmacy staff at the awards. Well done to the warm and friendly staff of the pharmacy - you are a credit to New Norfolk and shining example to other business. Good luck for the nationals!